The McKinsey Global Institute has produced a new report with the title "Debt and deleveraging: Uneven progress on the path to growth". The report discusses the challenge for advanced economies to reduce high level of debt and the potential consequences for growth. It is an interesting topic and, as it always the case with the MGI reports, it produces a detailed analysis of international data. There is, however, an methodological approach in the report that I do not share and that can be misleading. The report starts with a few charts of debt trends in the last decades. As an example, here is exhibit 1 from their report. 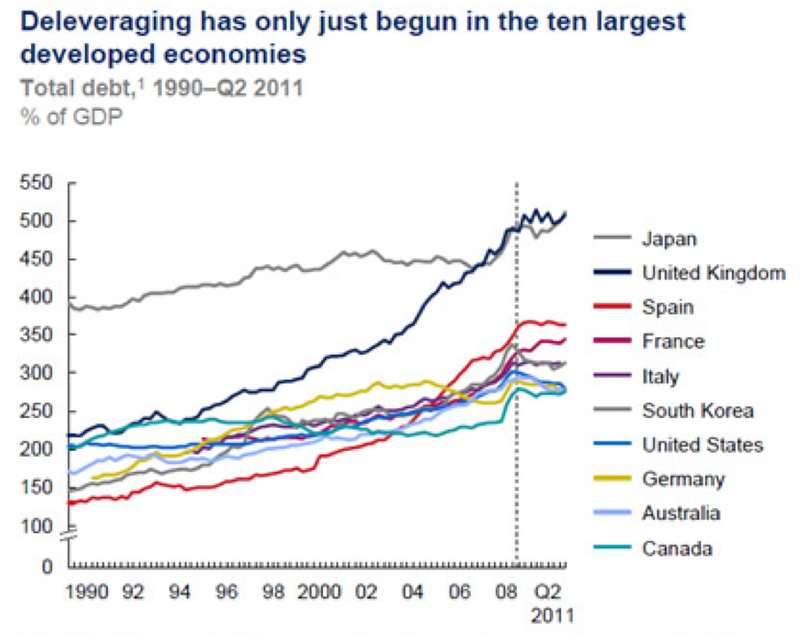 Among all economies we see an upward trend with increasing levels of debt, measured as % of GDP. The reading of this chart tends to be one of economies "living beyond their means", where spending outpaces income and where an adjustment is needed (deleveraging). This is not correct. As I discussed in an earlier post about government debt, the debt of one individual (or government) is the asset of someone else. 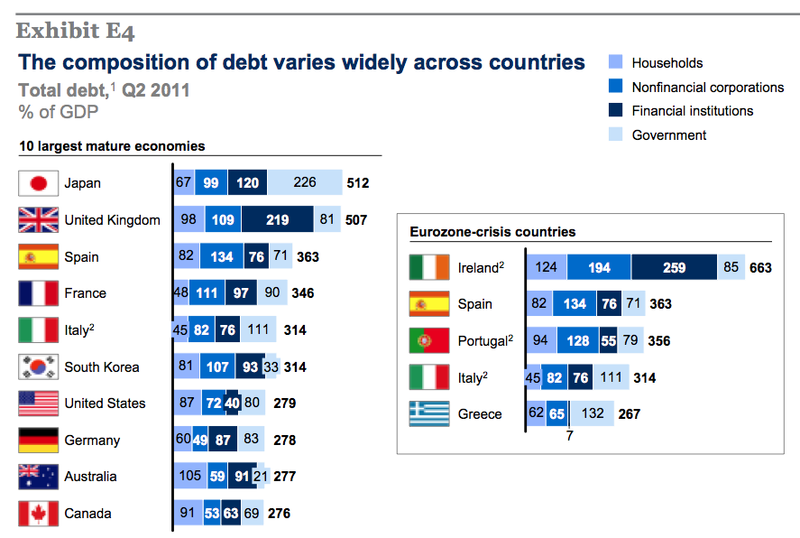 Looking at gross debt (as done in the chart above), can be very misleading. What matters for countries is their net wealth and not their level of gross debt. Let's think first about a closed economy. In a closed economy liabilities (debt) have to be equal to assets. What we know from the data is that as a country develops, the ratio of assets to GDP tend to increase. This is some times called "financial deepening" and it is measured as the ratio of money supply to GDP but where the money supply is a broad measure including a large number of asset classes. Higher levels of this ratio are seen as a positive development (larger financial markets). But in a closed economy, this ratio is identical to the Debt/GDP ratio. So a more leveraged economy is one where financial markets are simply more developed. Concluding automatically that this is bad or that an adjustment is required is not correct. When an economy is open then the right concept to measure is the net wealth of a country relative to the rest of the world. And this is the difference between foreign assets and foreign liabilities after consolidation of all internal debt. If we do not consolidate internal debt we are making the wrong assessment. As an example, in the McKinsey report, the country with the larges debt to GDP ratio is Japan (see chart below, also from the report). 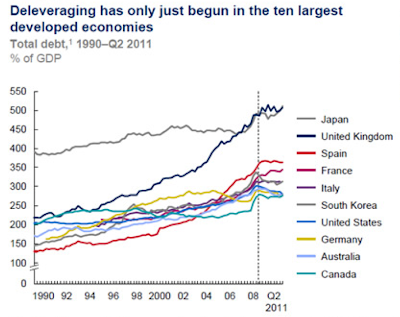 But Japan does not need to deleverage! Japan has consistently had large current surpluses and accumulated a large amount of foreign assets (it is in the same situation as China). The country does not need to reduce its debt. What is going on is that the government has a large amount of debt (226% of GDP), but this debt is held by Japanese citizens. But these private assets do not show up in the above calculations as only debt is included. The government of Japan needs to reduce its debt but not the country. 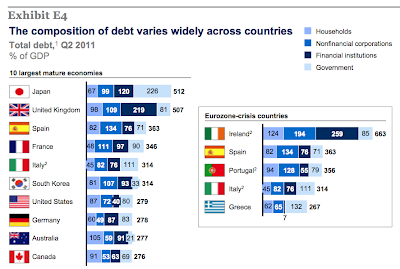 Similarly, if one looks at the Euro countries with difficulties these days, their debt levels are not that high. Correct, but if one were to look at their net foreign asset position (how much they owe to the rest of the world), in some cases we would see very large numbers (Greece, Spain) because of the large current account deficits they were running in the past. So while internal debt is not that high, external debt is and that is where we see their economic problems. New treaty, same old flaws. Learning from 2011, hoping for a better 2012. Debt does not matter. Spending and taxes do.